1. What is my audience persona? An audience or buyer persona is a powerful tool that can help inform your exhibiting strategy. This semi-fictional representation of your ideal target market can help you decide factors such as the in-booth activity, your exhibit design and flow, and even communication styles and messages pre, during and post-show. Just starting out building your buyer personas for 2019? No worries – there are lots of resources to help you. Aside from your own internal data and market research, your industry’s various associations also have demographic information they often publish right on the trade show website. Here is an example from a very well-known trade show. Taking industry data into consideration will help build a better picture of the actual real-life people that will (hopefully) walk into your booth. And ultimately, it will give your prospects a better overall experience with your brand and your brand’s message. 2. What outside influences (such as policies, laws, guidelines, etc.) should be considered when exhibiting? I can’t emphasize this one enough. Every industry, every city and every trade show is unique. When looking at your annual planning, it is not a one-size-fits-all approach. You have to consider all the outside influences and adjust accordingly on a show-by-show and city-by-city basis. The Javits Center in NYC has different exhibitor rules and regulations than a venue in a city like Nashville. 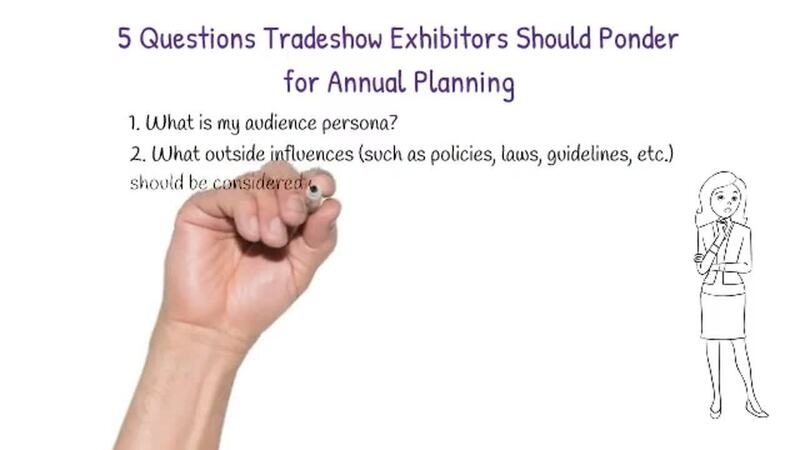 So, depending on where you will exhibit in 2019, it is important to consider these factors for each trade show and from a higher level. For example, if there are hanging-sign restrictions in one city but not another, you may need to contract additional vendors and will definitely want to pencil this in to your annual trade show budget. Some industries (and therefore industry associations) are, for lack of a better term, more laid-back than others. Then there are industry’s like pharma that are ever-evolving and very particular. Exhibitor rules and regulations should be scrutinized each year. 3. What does a typical exhibit design look like in this industry (and better yet, how can our exhibit design stand out)? This one may take a little legwork on your end if you are new to trade shows. As a marketer, I would suggest starting with your internal marketing team as they’ve likely done industry research to help create your company’s overall brand identity. This is one piece of the puzzle that you can keep in mind when planning graphics and your overall vision for the look and feel of your booth. Working with an experienced exhibit builder or exhibit design agency is the next step. Any good exhibit designer can help guide you in this area and tell you what they know about your industry, what trends they expect in the coming year and what recommendations they have to marry your brand’s identity with a design that will stand out and draw attendees to your exhibit. For a fresh look, perhaps review best practices and trends from other industries too. And for experienced trade show exhibitors, a simple refresh of graphics and messaging may be all you need. But, it’s always a good idea to look at your entire trade show schedule for the year and call a meeting with your vendors to help plan accordingly. 4. Should my exhibit have an educational (or interactive) component? Industry associations do a great job of attracting the right audience to the trade show. But, it’s your job to keep them engaged once they set-out down the aisles and walk into your booth. What’s right for your industry and your potential buyers? How does this audience like to learn? What is the best communication style for this audience? Does a hands-on approach make sense or is the style of your industry and this trade show one where a discussion-based message and follow-up is more effective? Some of this is trial and error, but you know more about your audience than you think. Tap into marketing campaigns that were successful in the past and apply them to your exhibiting style. But don’t forget about your goals for each show. If you are there for lead generation it may be a completely different approach than if you are focused on brand awareness. After all of the above have been considered and if you are planning an interactive component, this blog post has some good tips. 5. Are special events outside of the trade show floor common in this industry? It is becoming more and more common for trade shows and associations to create engaging experiences during an attendee’s entire stay – from sunrise yoga to after-hours parties – the typical modern attendee wants more interaction in exchange for his or her time away from the office and home. Look at ways you can capitalize on these special events and engagement opportunities such as through a sponsorship and renting show-management approved and designated meeting space where you can host non-traditional activities and one-to-one meetings. Be sure not to do anything that is frowned upon by show organizers such as an industry practice known as Outboarding. There are many opportunities to engage with your audience, just make sure you are playing by the rules.